1. Cupcake-flavored toothpaste: fulfilling the dream of fighting cavities with confection. Get it on Amazon for $6.55. 2. Lollipops for those who think pizza would be EVEN BETTER as a ball of corn syrup. Get them from Lollyphile for $8 for four lollipops. Also available in flavors like bourbon, blue cheese, chardonnay, and maple bacon. 3. A retro-style tabletop cotton candy maker for whipping up pillowy goodness at parties. 4. Milk chocolate mini cups because it's winter, time to get your shots. Get them on Amazon for $19.95 for 16. Also available in dark chocolate. 5. Cinnamon bun soaps you can use during your "Pour Some Sugar on Me" shower ballad. Get them from Aubrey E Apothecary on Etsy for $6.95 for two soaps. 6. These prosecco gummies for a chewy alternative to your favorite bubbly. Get them from Firebox for $10.39. Available in classic or fizzy. 7. A set of four sundae-ready ice cream bowls. Get them from Boutique Party Shop on Etsy for $22.99 (or one for $5.75). 8. 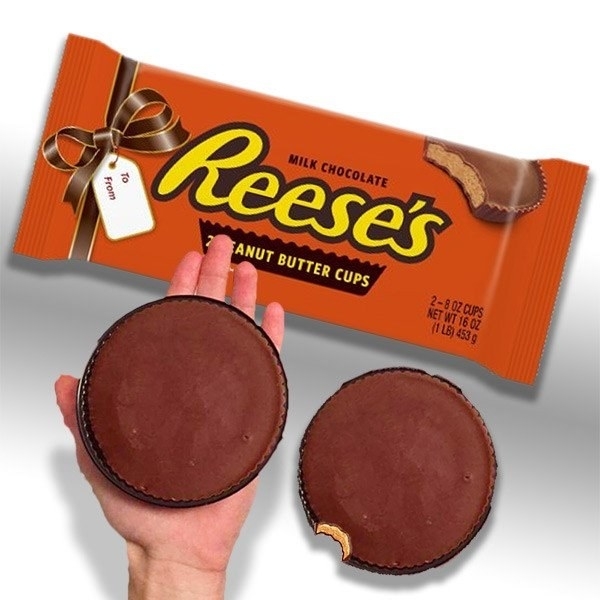 A chocolate stash for emergency cravings only. Get it from S & J Dezigns on Etsy for $27.14. 9. A set of five acrylic air-lock canisters that keep your collection fresh. Get them on Amazon for $19.99 for set of five. 10. Five pounds of any Haribo gummy your heart desires, from raspberries to peaches to happy cola. Get them on Amazon for $13.89+. 11. 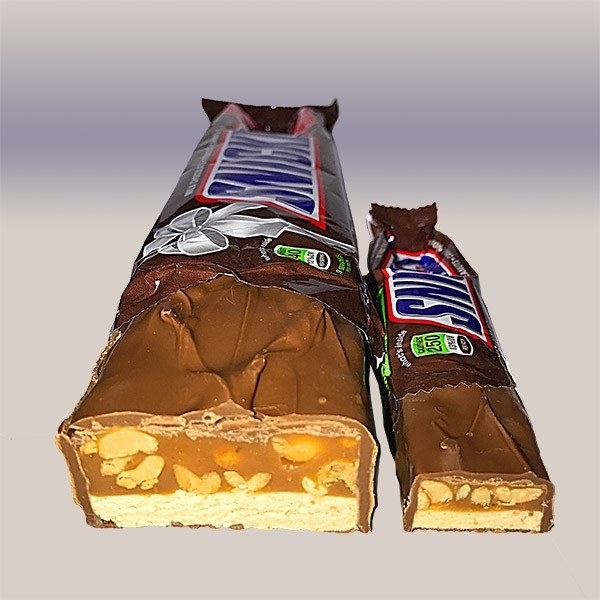 Or maybe one pound of Snickers or Reese's Cups. 12. 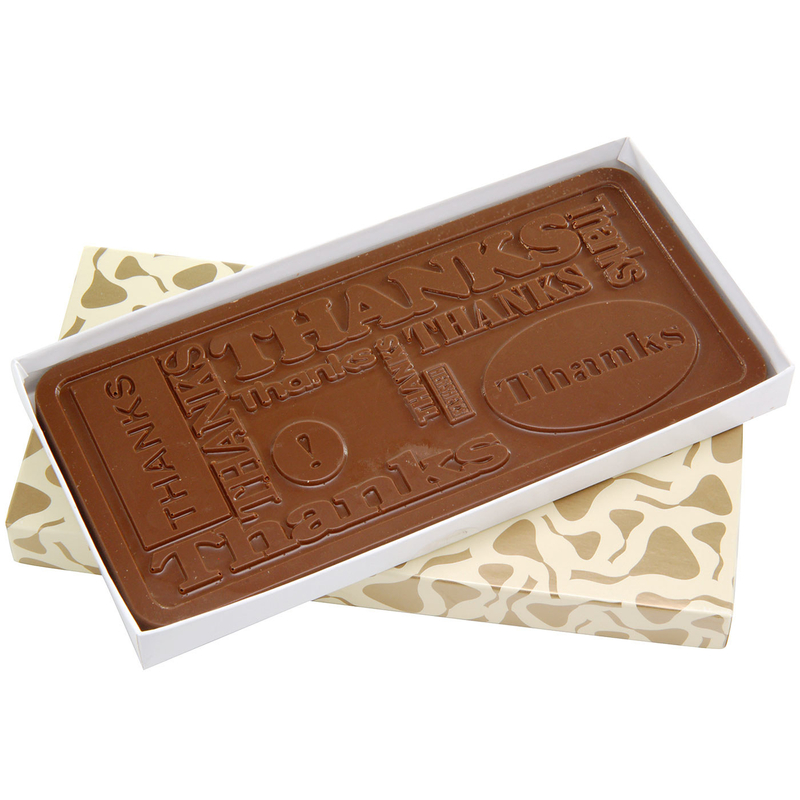 Milk chocolate Thank You, Birthday, and Valentine's Day bars that are (life hack!) a card and a gift in one. 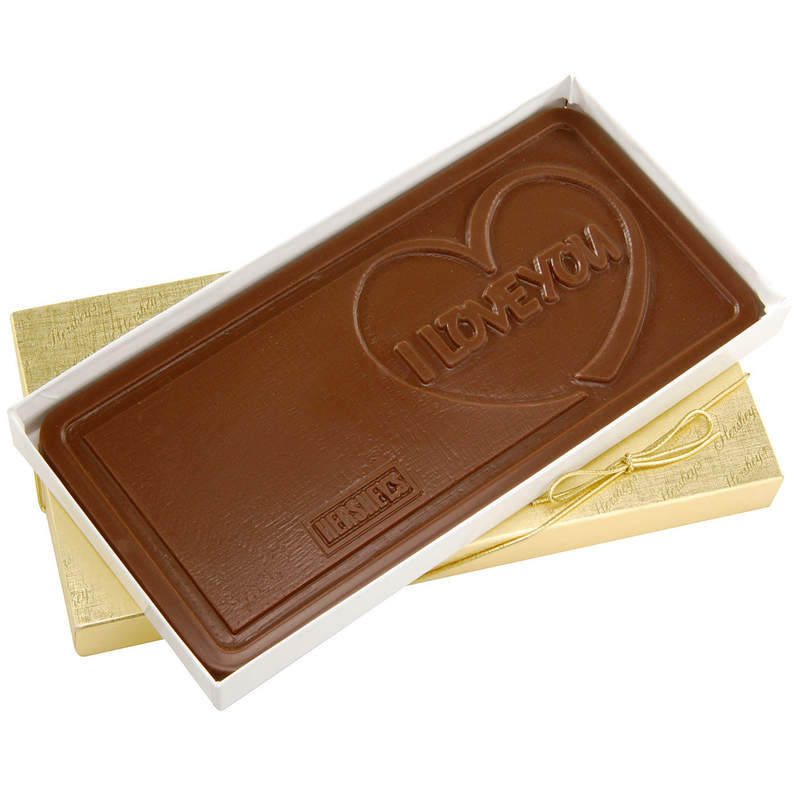 Get them at Hershey's Store for $10.95 (Valentine's Day) and $12.95 (Thank You and Birthday). 13. Caffeinated Coffee Cubes, for a pick-me-up that's a chewy candy rather than a scorching cup of bitter firewater. Get them on Amazon for $42 for 20 packs of four. 14. A pair of pink chocolate-dipped pretzel socks. Get them at Look Human for $11.99. 15. Lollipops that look like dragon eyeballs for your next D&D get-together. Get set of 24 from LIQNYC on Etsy for $55. 16. Candy shaped like raw fish. Get it on Amazon for $3.68. Available in five flavors, some more intriguing than others. 17. A candy cake far superior to the usual layers-of-bread cake. Get it on Amazon for $61.23. 18. Fresh Sugar Lip Treatment with SPF 15 for healthy lips as sweet as sugar. Get it at Sephora for $24. Available in 12 different flavors/tints. 19. 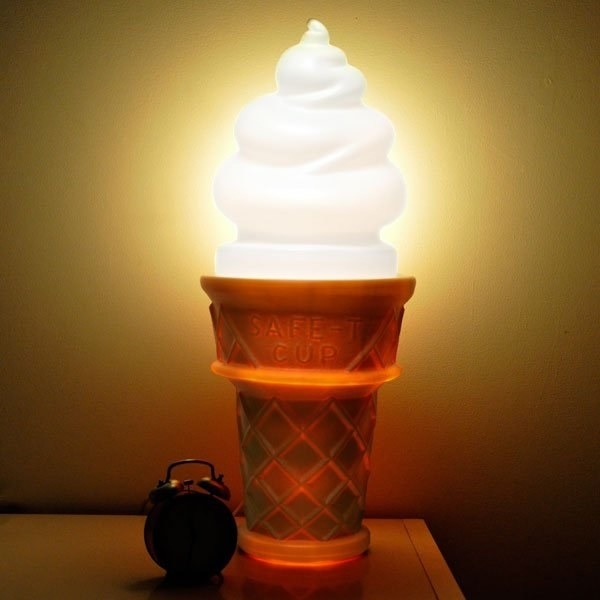 This lamp, because ice cream lights up your life. Get it from Great Big Stuff for $49.99. 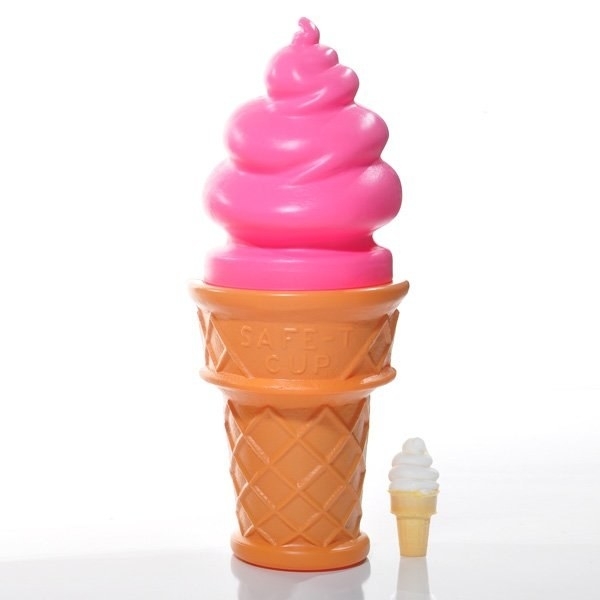 Also available in "hand scoop" hard ice cream-style cone. 20. And a vinyl wall decal for your kind of home. Get it at Wayfair for $25.99. 21. Jelly Belly's Beanboozled, a board game with sweet rewards and booger-flavored penalties. Get it on Amazon for $8.10. Also available with jelly bean refill pack. 22. A Coca-Cola series slush machine for Slurpee fiends. Get it from Amazon for $42.94. 23. A Hangry Kit containing 18 prescription-strength sour candies. Get it on Amazon for $17.99. Also available in super duper (36 candies). 24. Nipyatas, the piñata for people who pair their candy with tiny booze and violence. Get it at Nipyata for $89.99+. Also available in age- and holiday-themed. 25. Green apple-flavored gummy army men for all of us at war with kale. Get them on Amazon for $21.63 for five pounds. 26. A trip to the real-life Wonka Factory, chocolate-themed restaurant Max Brenner. Order a gift card here. See Max Brenner locations here. 27. A T-shirt of what makes you tick. Get it from RedBubble for $24.80. Available in 18 colors, sizes S-3XL. 28. And an actual 26-pound gummy bear with a hollow tummy bowl you can fill with more gummy bears. (Fork and knife not included, coma guaranteed). Get it at Vat19 for $149.99. Available in red cherry, orange, green apple, and blue raspberry.